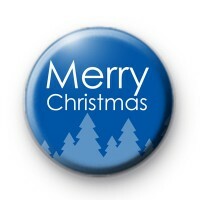 Blue Merry Christmas themed 1-inch button badge. This festive blue badge has Merry Christmas in white lettering and a row of Christmas Trees at the bottom. It is a nice, simple Xmas badge and it would look cute pinned to your coat during December.